The Apex Court is yet to decide on several petitions on whether to make Aadhaar mandatory for government services and the overarching matter of citizens’ right to privacy. But the present ruling by the First Appellate Authority (FAA) under the Right to Information (RTI) Act at the Tis Hazari Courts in Delhi is certainly a sigh of relief for many. The appellant filed an appeal under Section 19 of the Right To Information Act, 2005 being aggrieved by the Reply sent by the Public Information Officer at Tis Hazari Courts, Delhi. The appellant had originally sought information as to whether the disclosure of one’s Aadhar No. is mandatory for the purpose of filing before the District Courts in Delhi and/or the Hon’ble Delhi High Court. If yes, then whether the Delhi High Court had issued any directions in this regard. The reply to this was given by arguing that no such information is available with the Public Information Officer. The appellant contended before the Court that the Supreme Court of India had issued guidelines for filing case/bail/miscellaneous applications at filing counters, through a ‘Case Information Format’ which runs through a software named ‘Ubuntu‘. The format had some fields which were mandatory and those fields were identified by an ” * ” mark. The reply stated that the column no. 4 in the aforesaid format pertained to Aadhaar and it was not shown as mandatory. The Court upheld this contention and held that though the “case information format” as per the Guidelines of the Hon’ble Supreme Court Of India contains a column seeking the Aadhar Card No. 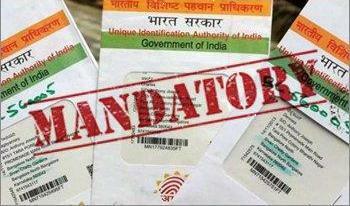 , it is not mandatory to provide the Aadhar Card No. for filing a case before the Court. With regards to the second issue, the Court found the reply of the Public Information Officer to be satisfactory. The Court, thus, dismissed the appeal.